A nurse provides critical care for those most in need. 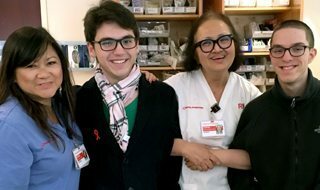 Claudette Theuriere was 23 years old and fresh out of nursing school when she landed her dream job: working in the neonatal intensive care unit at NewYork-Presbyterian/Weill Cornell Medical Center. “I always wanted to care for the most critical babies,” she says. Seeing those improvements — those small yet crucial changes in a baby’s first weeks and months — motivates her to this day. “I was lucky enough to find what I love,” says Theuriere. Now a clinical manager responsible for overseeing the NICU where she got her start 35 years ago, Theuriere says that despite the heartbreak of losing patients, she allows herself to bond with the babies and their families. She considers it part of the job. Two babies in particular have been a part of her life ever since they came into this world. Harrison and Chandler (Chad) Dillingham were born in September 1999, both premature. Harrison, weighing under 1 pound, was significantly smaller than his brother. Harrison had virtually no Apgar score — a measurement that indicates a baby’s condition right after birth. The delivery team was skeptical he would survive, but Tracy Berran, one of the neonatal nurse practitioners who helped deliver him, wouldn’t give up, doing everything she could to keep him alive. Nurses suggested using the “kangaroo method”— skin-to-skin contact with the mother, which seemed to help. Meanwhile, Chad, who was bigger at 2 pounds, 12 ounces, was placed in an incubator near his brother. Eventually, Harrison started to respond to treatment and grow stronger. 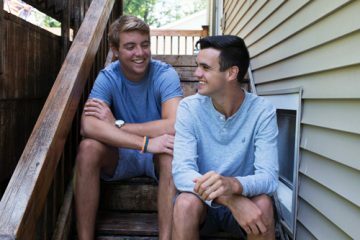 Chad was able to go home after 6 ½ weeks; Harrison spent the next 4 ½ months in the NICU. His mother, Deb, visited him every day during lunchtime and again after work, until around 11 p.m. She spent most weekends there as well for several hours each day. Those days were exhausting and scary. It was during that time sitting in a rocking chair that she grew close to the nurses, especially Theuriere. Seeing Theuriere every day, Deb and her husband felt a special connection with her. Just after the start of the New Year, it was Harrison’s turn to go home. When babies leave the NICU, it can be bittersweet for the nurses. “You’re really happy to see that they’re strong enough to go home, but you’re sad you won’t get to see them every day,” Theuriere says. Instead of drifting apart, the bond between Theuriere and the Dillingham family grew stronger. Theuriere joined family get-togethers and spent several Christmases at their home. Today, Theuriere helps facilitate the family’s annual Christmas visit to the NICU. Every Christmas Day, they bring teddy bears and handmade cards for all the babies’ parents in the NICU. The family goes room to room, a tradition that began when the twins were babies. “We do this so our children will never forget how important the NICU nurses were to our family as well as to all of the other families,” Deb says. “It’s a way to ultimately thank the nurses and bring hope to the families who are there in the hospital during the holidays. Although the boys will be in college soon, Theuriere doesn’t worry about visiting them. She knows she’ll see them next Christmas. Claudette Theuriere is the clinical manager of the neonatal intensive care unit at The Komansky Center for Children’s Health at NewYork-Presbyterian/Weill Cornell Medical Center.